January 17th to 19th: Level III. 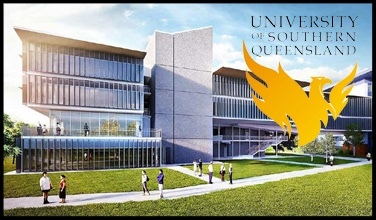 Somatic Voicework The LoVetri Method all three levels (I, II, and III) returns to Toowoomba, Australia (near Brisbane), January 11-20, 2019, at USQ Artsworx, University of Southern Queenslandand. More information here. November, 2017 On Friday, November 10th, Jeanie did a free demonstration class at her home studio in Manhattan 7:00 to 9:00 pm. for who wanted to see Somatic Voicework™ in action or to find out more about it was welcome. On Sunday, November 12th, 1:30 to 5:30, fee $85. Jeanie had a teacher support group and will work with students of SVW teachers in front of the group at her home studio in Manhattan. Refreshments included. There is a combined fee of $200 for both the Saturday and Sunday events. November, 2017 On Friday, November 3rd, Jeanie did free demonstration class at at a Boston area location to be announced from 7:00 to 9:00 pm. Anyone who would like to see Somatic Voicework™ in action or wants to find out more about it is welcome. On Saturday, November 4th, Jeanie held a Teacher Training Day for Somatic Voicework™ teachers (only) class at a Boston location to be announced. Teachers will work with each other with Jeanie’s guidance. Limited to 18 participants but observers who do not plan to teach may come if the limit is reached. On Sunday, November 5th, 1:30 to 5:30, fee $85. Jeanie worked with students of SVW teachers in front of the group at a Boston location to be announced. Refreshments included. September, 2017 On Friday, September 22nd, Jeanie did free demonstration class at a location in the DC/MD area from 7:00 to 9:00 pm. Anyone who wanted to see Somatic Voicework™ in action or to find out more about it was welcome. On Saturday, September 23rd, Jeanie held a Teacher Training Day for Somatic Voicework™ teachers (only) class at a location in the DC/MD area. Teachers will work with each other with Jeanie’s guidance. Limited to 18 participants but observers who do not plan to teach may come if the limit is reached. On Sunday, September 24thth, 1:30 to 5:30, fee $85. Jeanie worked with students of SVW teachers in front of the group at a location in the DC/MD area. Refreshments included. For more information about this events please contact Jennifer Suess. August-September, 2017 Jeanie attendind the Pan European Voice Conference (PEVOC12) August 30th to September 1st, in Ghent Belgium and presenting a workshop “the confusion about Belting” on Thursday, August 31st, 5:45 to 6:30 pm. For more information visit the PEVOC12 website. April, 2018 On Friday, April 13th, Jeanie will do a free demonstration class in Holland Michigan 7:00 to 9:00 pm. Anyone who would like to see Somatic Voicework™ in action or wants to find out more about it is welcome. On Saturday, April 14th, 10-5 with a fee of $125. 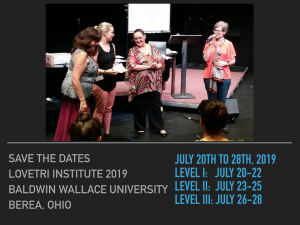 Jeanie will hold a Teacher Training Day for Somatic Voicework™ teachers (only) Holland Michigan refreshments included. Teachers will work with each other with Jeanie’s guidance. On Sunday, April 15th, 1:30 to 5:30, fee $85. Jeanie have a teacher support group and will work with students of SVW teachers in front of the group in Holland Michigan. Refreshments included. April, 2018 On Friday, April 27th, Jeanie will do a free demonstration class in the Washington DC area 7:00 to 9:00 pm. Anyone who would like to see Somatic Voicework™ in action or wants to find out more about it is welcome. On Saturday, April 28th, 10-5 with a fee of $125. Jeanie will hold a Teacher Training Day for Somatic Voicework™ teachers (only) Washington DC area refreshments included. Teachers will work with each other with Jeanie’s guidance. On Sunday, April 29th, 1:30 to 5:30, fee $85. Jeanie have a teacher support group and will work with students of SVW teachers in front of the group in Washinton DC area. Refreshments included. May, 2018 On Friday, May 18th, Jeanie will do a free demonstration class in New England Conservatory in Boston 7:00 to 9:00 pm. Anyone who would like to see Somatic Voicework™ in action or wants to find out more about it is welcome. On Saturday, May 19th, 10-5 with a fee of $125. Jeanie will hold a Teacher Training Day for Somatic Voicework™ teachers (only) in Cambridge Mass area refreshments included. Teachers will work with each other with Jeanie’s guidance. On Sunday, May 20th, 1:30 to 5:30, fee $85. Jeanie have a teacher support group and will work with students of SVW teachers in front of the group in Cambridge Mass area. Refreshments included. June, 2018 Jeanie LoVetri and Jocelyun Medina will present “Overview of Current Term Usuage for Contempory Commercial Music and other Non-Classicl styles” at the Voice Foundation on Sunday, June 3rd at 1:40 pm at the Westin hotel 99 South 17th street Philadelphia Pa.